Today we are living through and largely partaking in what I believe will someday come to be known as The Great Animal Holocaust. As a global society, we eat the flesh of animals as part of our diets. Some regions, groups, and individuals, including myself, may choose otherwise, but by and large we consume animals and products of their reproduction (eggs) and lactation (milk-based foods). I realize that animals hunt and eat other animals as a natural course of and expression of their nature. We have also hunted and eaten animals throughout history. 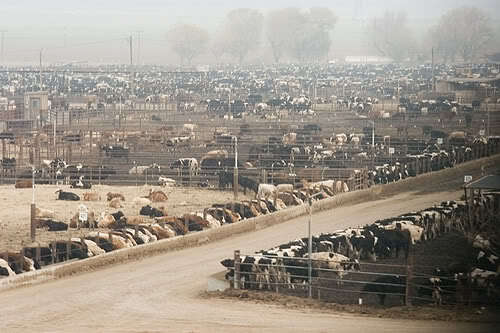 What is unique to this day and age is the mass cultivation of animal flesh and products in factory farms, raised only for our consumption. I recently heard that more than 8 billion (yes with a “B”) land animals are raised annually for consumption in in the United States. 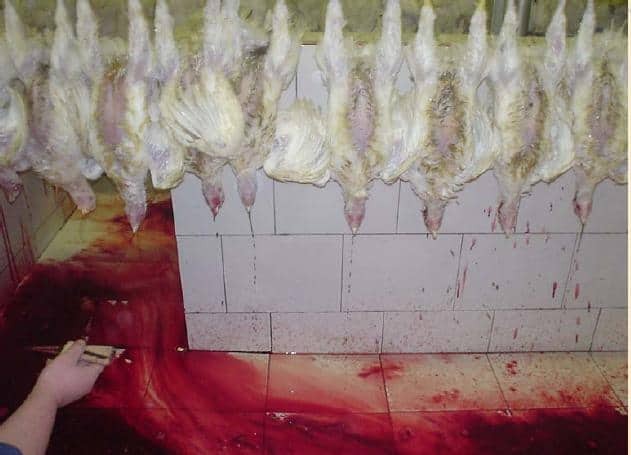 That equates to an average of about 25 animals per man, woman and child that are raised, killed and eaten each year. Imagine if you had 25 animals in your back yard – cows, chickens, ducks, pigs – at the beginning of the year, and throughout the year you had to go back there and shoot one, or slit one’s throat. If you are part of a family of 4, then you would take 100 trips back there to kill an animal for your family. Now take it a step further and imagine conditions for a large majority of these animals being something that you would never in your nightmares want to live in let alone next to, chickens 8 to a small cage, cows raised in filthy conditions not grazing on lush grassy fields as the meat industry would like you to believe, pigs in cramped stench-filled concrete pens. This is the holocaust I am writing about here, the mass cultivation of animals, the mass slaughter of these animals and the mass processing of their flesh, solely for our consumption. Fact: It is easy to get more than an adequate amount of protein in our diet from the consumption of non-animal products – nuts, grains, corn, legumes all contain sufficient protein to keep us healthy. Myth 2: The small family farm with happy, healthy smiling animals is an integral part of our food production system. Fact: a vast majority of all animal flesh and animal products consumed by Americans is raised in intensely concentrated factory farming conditions, sometimes containing 10s of thousands of cows or pigs and millions of chickens. I felt encouraged to begin writing this on a recent flight by a flight attendant who asked me whether I wanted “chicken or beef?” They asked it as if it were perfectly natural to choose solely between these two options. As a side note, in America these days, it’s curious to note that most salads on restaurant menus now come with some form of meat included. Since when did the salad become yet another animal flesh delivery mechanism? 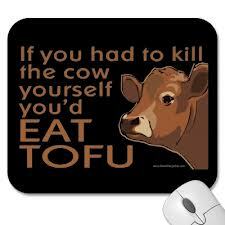 We are part of a culture in which animal flesh consumption has become so mainstreamed that we don’t even question it. Today the average American eats twice the amount of meat per capita than it did 60 years ago. I would venture to guess that this is largely due to the very effective marketing and lobbying efforts of the various animal-based food councils. It takes a long time to make definitive lasting societal change, especially when money and power are involved. Only less than 100 years ago did women get the right to vote. Only 40 years ago did those 18 years of age get the right to vote. Only 150 years ago did slavery become illegal. Only 50 years ago did African Americans begin to get significant federal protection against discrimination (and there is still further yet to go). Only these past few years have the rights of gays to marry and adopt children begun to become more accepted by mainstream society. These groups largely fought for their own cause in bringing about change. Unfortunately non-human animals don’t have a voice with which to speak, nor money with which to lobby and influence policy which would bring them protection. Thus this change is destined to unfold more slowly, Eventually, either by necessity, since we will need to become much more efficient in the use of our lands and limited supplies of waters, or by reaching an ethical tipping point as each successive generation consists of more and more people who eschew eating animal flesh, we will emerge from this period and look back at this Great Animal Holocaust as simply another blind spot in our collective emancipation into a more just and morally compassionate society. To those of you who only eat organic meats, you are undoubtedly eating flesh from healthier animals, with fewer antibiotics, hormones, pesticides/herbicides, etc., but please don’t fail to keep in mind that organic chickens still have their throats slit and bleed to death, female dairy cows are still butchered at an unnaturally young age, males calves are almost all killed by the age of 6 months, organic cows are still fattened in intensive feedlots albeit with organic feed, billie kid goats are almost all killed and tossed as waste, and dairy cows who suffer from common infections in their udders are often not given antibiotics so that their milk can still be sold as organic. Finally, “organic” animals are generally slaughtered at the same slaughterhouses as their “non-organic” brethren, in the same terrifying manner. I can’t speak for you, but I for one don’t want to participate in a food system that kills other living beings, and engenders widespread suffering in the process, and I certainly don’t want any of this unnecessary suffering to touch my lips. Interesting topic. As crazy as it sounds, I wonder what the population of these animals (e.g., cows) would be if it wasn’t for their role in the food industry. Certainly many of the domestic animals would have difficulty surviving in what little “wild” is left. And, most of these animals don’t make ideal pets. I’m not condoning the poor treatment of animals, but I just wonder how many would exist if people stopped eating meat entirely. Ted, I strongly support your passion for this topic. I don’t proselytize about being a vegetarian (16 years now) and I didn’t become one because of animal cruelty, but shortly after making the change to veggie, the treatment of animals for food because a very strong secondary reason to never eat meat, port, chicken, fish…The book “Diet for a New America” was a real eye opener. I don’t think it’s as much about big “money” driving the increase as it is a rising global middle class. People always want to blame suppliers and let the buyers off the hook. The truth is, as people get wealthier, across all classes, race, gender, they have similar habits, one of which is dramatically more animal protein consumption. If people demand veal, someone will supply it. If someone wants white meat chicken, someone will supply it. The antibiotics they pump into cattle because they’re being fed grain instead of their natural diet of grass is horrifying. If we could educate the buyers on how “sausage is made,” that’s where things could change. In the mean time, if we could just get westerners to eat even slightly less animal protein…one less burger per week, the suppliers would take notice. There are some positive signs of change from suppliers. Years ago, McDonalds required suppliers of meat to provide a more “humane” way to kill cattle, based on a fascinating autistic visioneery named Temple Grandin. My hope is that in an iPhone/YouTube society, the visuals of animal destruction become more prominent. There are so very few pages on the web dealing with the animal holocaust. Therefore I appreciate your animal holocaust page. Many sentiments are my own. However, the only way people will stop eating animals, and bring an end to the animal holocaust, is when people successfully research how to make artificial meat – as real as and cheaper and plentiful than animal meat. Being a veggie/vegan will not influence anything. Best regards, Ben.